Father Maurice Kweirang, in charge of St. Theresa Catholic Church’s IDP camp in Yola, in Nigeria’s north-east Adamawa State, talking to World Watch Monitor. ”…There are many of them in such a situation. They live in host communities but are facing malnutrition, mostly unnoticed. Nobody takes care of them even though they are here in large numbers. They refuse to go back to their homes and villages, because those who went back are starving now”. Almost a quarter of a million children in parts of Nigeria’s Borno state, formerly controlled by Boko Haram, suffer from severe malnutrition, UNICEF says; tens of thousands will die if treatment does not reach them soon, it warns. The seven year rebellion by the Islamist group has left 20,000 people dead and more than two million displaced. The crisis is particularly acute in Borno State, but other neighbouring states like Adamawa and Yobe are also affected by the crisis. Recent Nigerian Army military operations, which led to the recovery of territories previously under Boko Haram’s control, have revealed the scale of the humanitarian needs of civilians living in the three states. In many areas where Boko Haram militants had been in control, UNICEF found people without water, food or sanitation. Last month, MSF (Doctors Without Borders) said as many as six people were dying daily from disease and malnutrition at a displaced people’s camp in Bama, in Borno. Borno is most affected: 4.5 million people are estimated to be in need of humanitarian assistance, and 4.1 million are ‘food insecure’. In Yobe 3.2 million people are estimated to be in need, including 2.3 million ‘food insecure’, while in Adamawa 900,000 people are ‘food insecure’. IDPs (Internally Displaced People) within host communities or informal camps have the highest needs, followed by those in formal (government-run) camps. However, many IDPs face discrimination because of their religious background. This is particularly true in Borno State where IDPs are put in camps according to their geographical origins, regardless of religion. That’s why many of the Christians have moved on to Yola, points out Fr. Kweirang. 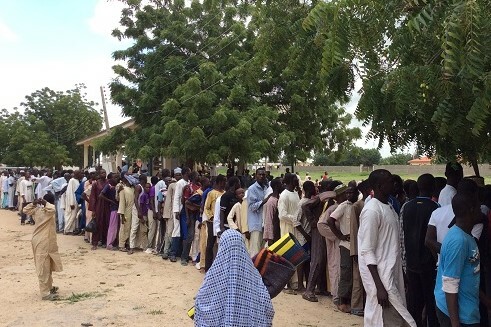 But while in Yola, many refused to go to government-run camps like the Maikohi camp. Some of them said they even saw militants near that camp. But despite their complaints, government officials refused to listen or to take the appropriate measures. (However later, there was a bomb blast which claimed seven lives in the camp). The St.Theresa camp has about a thousand people, originally from Gwoza, in areas called Bayan Dutsi (“behind the Gwoza hills” in Hausa). Gwoza used to be a Boko Haram headquarters. Despite recent military campaigns and territorial gains by the government, Boko Haram militants still parade in that area freely, which makes it difficult for IDPs to go back to their villages and communities. “Actually more and more IDPs are coming from southern Borno to our camp, but we’ve reached our hosting capacities” says the priest. Since it is the most affected by the insurgency, Borno State has received a lots of support from all over the world. ”Unfortunately the authorities are not well organised and they are not able to take that aid down to the local people in need”, says Fr. Kweirang. Politicians and government staff have also diverted relief material for themselves, claims the cleric. ”This crisis is a result of a deliberate act of mismanagement by officials. Foods and other non-food items destined for IDPs have been diverted. They are selling them in open market in Maiduguri [Borno’s main city] and elsewhere”. International NGOS are not doing enough as well, he claims – because they are working under the state Emergency Management Agency which, he said, is ineffective. For now, he says, the IDPs in his camp are not facing hunger, but the church’s resources are over-stretched. ”For more than a year we haven’t received any external support. Basically the church is trying on its own to take care of this population. ”Some weeks ago, I sent a request/letter to NEMA (National Emergency Management Agency), asking for food aid and non-food items. But they said they cannot assist us, claiming that they don’t have enough resources to assist anybody. ”I also contacted international organisations like Oxfam, International Rescue Committee (IRC) but I haven’t heard from them. I am still waiting – while people are still there in the camp and we have to find food to feed them”. As a result of the pressures, the diocese of Yola, in charge of the camp, was not able to embark on other programmes which are usually done, because all its resources are now going into feeding these people.